Brian Hirtle was elected for his second term as Municipal Councillor in the new Polling District No. 3 on October 15, 2016. 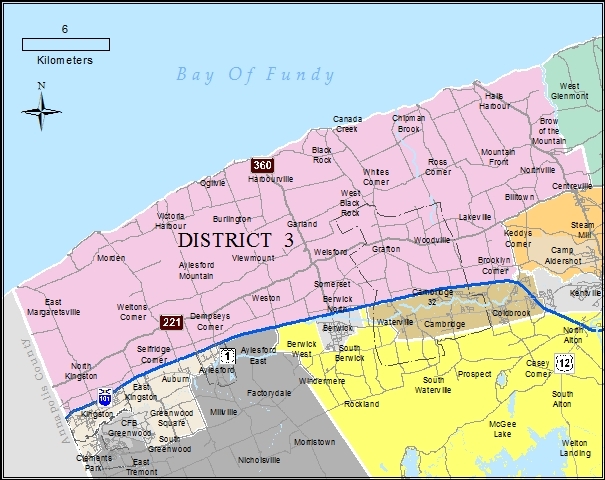 This district is located north of Highway 101 from Centreville to the Annapolis County line, and includes the communities of North Kingston, Morden, Weltons Corner, Dempseys Corner, Viewmount, Burlington, Garland, Harbourville, Welsford, Weston, Somerset, Grafton, Canada Creek, Black Rock, Chipman Brook, Woodville, Lakeville, Billtown, Centreville North, Huntington’s Point, and Halls Harbour. Brian was elected Deputy Warden in November 2013, and served for three years in this position. During his first term as Councillor, Brian chaired or served on more than a dozen committees, including Budget and Finance, Planning Advisory, Fire Department, and Valley Waste. He also served on two provincial planning committees for the Union of Nova Scotia Municipalities. As Deputy Warden, Brian was often called upon to stand in for the Warden whenever the Warden was otherwise engaged. He was instrumental in downsizing Council and in instituting the mayoral system within the Municipality. Brian is dedicated to the development of our communities. He has a long history of volunteering with various organizations and community groups, including the Burlington Community Club, Cornwallis Headwaters Society, and the Berwick & District Fire Commission. During his first term, he worked hard to ensure that the constituents of his district were aware of the various government services available to them and how to acquire these services. His many years of community service have helped him gain the knowledge, skills, and ability to better serve his constituents as Councillor. Brian is a family man with over thirty years’ experience in the manufacturing sector. Brian was born in Berwick and lives on the family farm in Viewmount with his wife Glenda, as a fourth generation small farm owner. They have three children: Marylee (Weston), Craig (Calgary), and Chris (Halifax), and five grandchildren (Liam, Aiden, Leah, Catherine and Ava).